Since 1996 Yoko Ono has incorporated a wish tree into her work. Four years ago, my husband, who was only my dance partner at the time, and I went to her Wish Tree for Pasadena and filled out wishes on pieces of paper and tied them to a tree at One Colorado. I don't recall what I wished for, and the tags with string are more American than Japanese. I was reminded of those tags when I saw SDSU professor Wendy Maruyama's "The Tag Project." Keep both the wish trees and The Tag Project in mind when you see the movie "Emperor." Maruyama's project uses 120,000 paper identification tags—each representing an individual of Japanese descent who was imprisoned in one of the ten so-called relocation centers during World War II—and the tags are grouped by camp into an 11-foot-tall 100-pound hanging mass that resembles a trunkless tree. My relatives names would be included on those tags in at least two different internment camps. The Japanese wish trees are commonly seen at temples or shrines. People buy scraps of paper and write wishes before tying them to a tree. The strips of paper flutter in the wind. From afar, they could be white flower blossoms. In some cases you can read what other people wrote. On the Asian sweetheart's day, Tanabata, this act can be particularly romantic. Tanabata is a festival about star-crossed lovers and "Emperor" is also about ill-fated lovers. Based on the real Occupation of Japan, the movie uses romance to make the journey worth taking because we already know how history played out. The emperor of Japan, Hirohito, was not tried as a war criminal and was allowed to remain the figurehead of the Japanese government until his death in 1989. The Japanese Imperial House is the oldest continuing hereditary monarchy in the world. The movie takes and expands a vague notation from a real general, Bonner Fellers, about visiting an unnamed friend in Japan. Davis Klass and Vera Blasi's screenplay supposes that friend was female and the object of Fellers' affection. You might be tempted to dismiss this as another white man's exotic Oriental adventure in the same mold as Madame Chrysantheme (the French precursor to Madame Butterfly), but this movie displays more than the usual sensitivity toward Japanese attitudes on American policy. Yet these culture crossing ambitions aren't fully developed, leaving us with a love story that is more simplistic than simple and with a history lesson that has managed to raise some objections in the Los Angeles Japanese American community. While I understand "Emperor" is only based on a true story and I shouldn't expect it to be faithful to history, it is also not the story about being unfaithful. You'll see what I mean below. The movie starts with grainy black and white archival shots of "Little Boy," the atomic bomb that was dropped on August 6, 1945 on Hiroshima (Three days later "Fat Boy" was dropped on Nagasaki). The film shows us the devastation of Hiroshima, a stark treeless landscape. 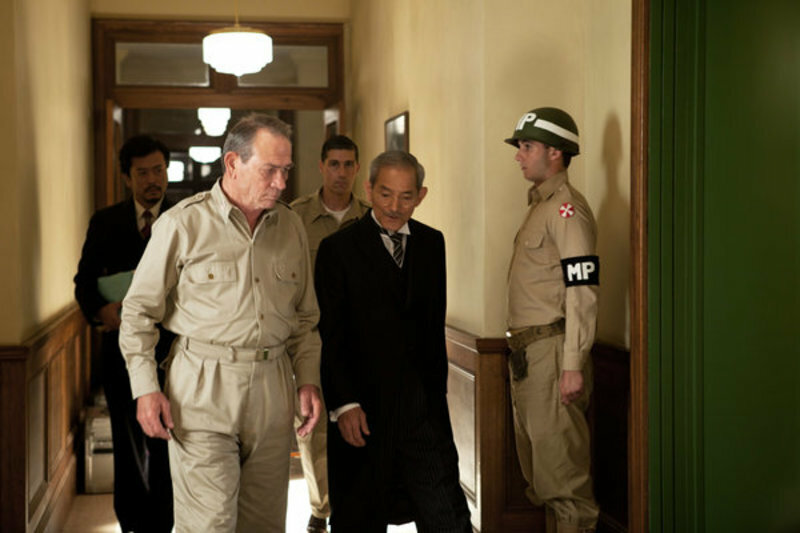 By the end of August, Douglas MacArthur (Tommy Lee Jones) is on a plane with his staff (including Fellers), going to Tokyo to set up the Occupation of Japan at the Dai Ichi Life Insurance Building. MacArthur's staff on the plane and, indeed, all the people at Dai Ichi are portrayed as white men and this sets up the first historical and logical problem. The military at the time was still segregated, but one possible exception to this was Military Intelligence Service members. MIS during World War II had two branches—one specializing in Japanese and the other in German. The Japanese branch was comprised predominately of Japanese American Nisei who helped military units with translation, interpretation and interrogation. Although they were a secret much like the Navajo Code Talkers and the female "computers," in 2010 the 6,000 Japanese Americans who worked as part of the MIS were awarded the Congressional Gold Medal. Yet you won't see any trace of the MIS Nisei service men in this movie. At the end of World War II, the victorious Allies had to decide who would be tried for war crimes and in Japan's case, MacArthur needed to decide if Japan's emperor would be found responsible for the war and tried as a Class A criminal. He puts Japanophile Fellers in charge. Through flashbacks we learn that Fellers (Matthew Fox) has an ulterior motive. After meeting a beautiful Japanese exchange student, Aya (Eriko Hatsune), at the fictional Douglaston College in 1932, he pursued her even after she suddenly returned to Japan. A member of the military already, he finagled an assignment in Japan to write about the psychology of the Japanese. Fellers based his article on conversations with Aya's military officer uncle. Not the best methodology, but dammit, we were on the brink of war and that's unfortunately how a lot of research materials on Japan was produced during that time period. The coming war forced the two apart. During the war, Fellers lost contact with Aya, and now back in Japan, he searches for her during the ten days the Supreme Commander of the Occupation, Douglas MacArthur, has given him to decide if the emperor will be charged as a Class A Criminal in the Tokyo War Crimes Trials. Fellers is well aware that while MacArthur wants to show Japan "old-fashioned American swagger" and declares that his mission is to rebuild Japan, MacArthur also intends to enlarge his legend and potentially run for the White House. Bonner Fellers's investigation and his search for his beloved Aya are assisted by his English-speaking Japanese chauffeur, Takahashi (Masayoshi Haneda). This is not exactly shades of the Green Hornet's Kato, but this single role eliminates the need for any MIS Nisei. Yet would U.S. military really trust a Japanese national to facilitate these top secret actions, particularly after forcing the American-born ethnic Japanese to sign loyalty oaths during their incarceration at internment camps? What Klass and Blasi's script does provide is a small historical counterpoint. Aya's uncle mentions the pre-Pearl Harbor oil embargo in 1941 (Pearl Harbor was bombed in December of the same year). Consider what the U.S. has been willing to do in recent years for oil. Further, the former prime minister Fujimaro Konoe (1940-1941) asks what is different about Japan's imperialism (the motto then was "Asia for the Asians") compared to what the British, French and Americans had been doing. "We are simply following your fine examples," he comments. Contrasting aspects of imperialism could have made this movie more complex and increased understanding of the Tokyo Trials but this thread isn't pursued. Yet "Emperor" gives us the impression that except for one bad egg, the U.S. Forces in Japan were an impressively upstanding and fair bunch. Fox as Fellers has that anxious integrity he also displayed in the TV series "Lost." Fox also has real chemistry with the willowy Hatsune, but that alone is not enough to create a believable torrid romance. When Hatsune's Aya tells Fox for a Japanese woman, she's quite daring the only evidence we have is her hairstyle. Her courage rationalizes her risk at having an affair with a foreigner but director Peter Webber doesn't draw out much more than that. In the movie, what prevents Fellers and Aya from getting married are her dead father's request that she not marry a foreigner and the Japanese military propaganda which encourages kids and others to hate foreigners. The Japanese propaganda is only half of the story. In the real world, prior to the militarization of the Japanese government and the oil shock, anti-foreign sentiment in Japan was also stirred up by the unequal treaties forced on Japan by Western nations (U.S., Great Britain, Netherlands, France and Russia), and biased laws in other countries such as the U.S. that treated Japanese nationals poorly. Similar treaties had been forced on China (China's Century of Humiliation) and Korea (by Japan first and then Western nations including the U.S., France, Germany, Italy and the U.K.). The U.S. and other countries portrayed East Asians as the yellow peril. Some U.S. states had miscegenation laws that included Asians, Native Americans and Filipinos as well as blacks. Then there were the anti-immigration acts aimed at the Chinese and Japanese. This reality is left out and in the movie, in the flashback sequences where Fellers romances Aya, the U.S. seems dreamily peaceful, even for East Asians. The real Fellers had a longer deadline to accomplish his mission and historians such as Herbert Bix and John W. Dower concluded that MacArthur's headquarters and Fellers worked almost as a defense team for the emperor. Then there's that one detail which could kill the romantic storyline and make the love story flutter into "Madame Butterfly" territory: In 1925, Fellers married Dorothy Dysart. She was not, like the MIS, a secret that the writers could have easily overlooked. He wrote letters to her about his relationship with MacArthur at a critical time when Fellers and Dwight Eisenhower were both on his staff. She died in 1981. This movie doesn't mention her, and Fellers and Aya's love isn't tainted by adultery. Of course, other movies have conveniently removed wives from the story such as the 1989 "Glory," which looked at the 54th Massachusetts Volunteer Infantry—the first all African American formal infantry unit. To my memory, Matthew Broderick's Colonel Robert Gould Shaw wasn't portrayed as married although the real Shaw was. But that movie was about race and war, not star-crossed lovers separated by war. "Emperor" attempts to treat this moment in history as if race didn't matter. The Tokyo War Crime Trials and the conviction of Japanese American Iva Toguri D'Aquino, the reputed Tokyo Rose, were plagued by questions of law and racism. Consider the judges of the Tokyo Trials. One of the 11 judges, Delfin Jaranilla, was a Bataan Death March survivor. The Chinese justice, Mei Ju-ao, had no experience as a judge at all. The judge from the U.S.S.R., I. M. Zaryanov, didn't speak either of the two official languages of the tribunal. The designated president of the tribunal, Australian William Webb, had investigated Japanese Imperial Army actions in New Guinea. Despite this Webb was against the death penalty for conspiring to wage, or planning, preparing, initiating or waging aggressive war, observing that no Nuremberg defendant had been sentenced to death for the crime of aggressive war and questioned if the Japanese defendants were being treated "with less consideration than the German accused." Roling objected to the death penalty for non-military personnel and for anyone for crimes against peace. Justice Radhabinod Pal of India was the only justice with prior experience in international law and his dissenting opinion was banned during the Occupation. He would have found none of the defendants, including the emperor, guilty because conspiracy to wage aggressive war was not considered an international crime in 1937 and Western colonialism and the dropping of the atom bomb were not on the list of war crimes. Justice B. V. A. Röling of the Netherlands commented, "It was horrible that we went there for the purpose of vindicating the laws of war, and yet saw every day how the allies had violated them dreadfully… Tojo was right that in this respect Tokyo was victor's justice only." "Glory" looked at the uncomfortable gray areas of racism and the two cultures that uneasily co-existed in America during the American Civil War. You could hardly imagine a historical black-white romance set during the Civil War or the 1940s involving Africa and the U.S. that didn't touch on American racism. Without the inclusion of American racism toward Japan and the Japanese Americans, the movie "Emperor" remains within the propaganda of MacArthur's time. The movie ends by telling us the fate of the Class A war criminals who were portrayed, but doesn't hint at the true nature of the trials or the Occupation. The absence of the changing landscape of race and segregation within the armed forces and the attending legal and moral considerations set "Emperor" in another era of movie-making. Is that really acceptable now? With all the legal racism within the victorious countries of World War II in the 1940s and after, how could we expect the Tokyo Trials to be fair? Why even bother to name the character after a real person when you conveniently forget his wife? Oddly, director Webber and his crew set the mood for the film with loving attention to the surroundings. The sets are certainly beautifully done. According to the press notes, the period of Japan hasn't been seen in a Hollywood film since the 1956 "Teahouse of August Moon" which starred Marlon Brando. That was Brando in historically acceptable 1950s yellowface. The production designer for "Emperor," Grant Major ("Lord of the Rings"), used an industrial site in New Zealand to create the burned-out Tokyo scenes which were quite effective. Grant also re-created the Imperial Palace and MacArthur's offices based on black and white photos. The look of the movie and the attention to detail in the costumes (Oscar-winning Ngila Dickson who worked on "The Last Samurai") are exceptional, but in the end, the story is not. So you might be wondering why I mentioned the wish trees. Keep the wish tree images in mind for the scene where the Fox as Fellers discovers the fate of his beloved Aya. Yet do not think of Aya when you want to see a real strong Japanese woman. Instead think of Yoko Ono as an example of a Japanese woman who rebelled against tradition. She was famous in the art world before she met and married John Lennon. "Emperor" had the potential to begin a discussion about Japan, race and history and peace but falters, wasting the convincing imagery of the set design and the tender chemistry of its leads. In the end, "Emperor" makes me wonder about artistic license versus ethics and how Bonner Fellers will be remembered in popular culture or if the existence of his wife Dorothy will be remembered at all. And, sadly, I also wondered how long Japanese Americans and other minorities will be whitewashed out of history at the movies. August is the month when the atomic bombs were dropped on Hiroshima and Nagasaki and when the Japan surrendered in 1945. August is also the month that President Ronald Reagan signed the Civil Liberties Act of 1988 into law, officially apologizing for the incarceration of 120,000 Japanese Americans during World War II and awarding $20,000 to each of the survivors. By the lunar calendar, Japanese and Japanese Americans celebrate Tanabata and this movie and others have left both a lot to wish for. "Emperor," which was given a limited release in March of this year, is now available on Amazon Instant.